11/01/2010 - Chile will become the OECD’s 31st member and its first in South America under an accession agreement signed on 11 January at La Moneda in Santiago by OECD Secretary-General Angel Gurría and Chilean Finance Minister Andrés Velasco in the presence of President Michelle Bachelet. Chile’s membership will become official once necessary formalities, including parliamentary approval, have been completed. Chile’s acceptance for OECD membership marks international recognition of nearly two decades of democratic reform and sound economic policies. For the OECD, Chile’s membership is a major milestone in its mission to build a stronger, cleaner and fairer global economy. “The ‘Chilean way’ and its expertise will enrich the OECD on key policy issues” said Mr. Gurría during a signing ceremony in Santiago. “Chile has been engaged in a continuous effort to reform its economy. 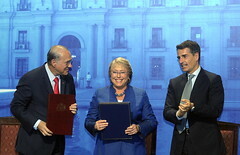 President Michelle Bachelet with OECD's Secretary-General, Angel Gurría and Finance Minister, Andrés Velasco at La Moneda, Santiago de Chile. This experience will be an asset for the OECD as we try to address issues such as inequality or sustainable pension systems” (read the speech in full). President Bachelet hailed Chile’s accession to the OECD as “the start of a new road towards the future that opens new and great opportunities to advance more rapidly'' towards the ranks of the world’s developed countries (read the President's speech). With both Chile and Mexico as members, and thanks to increasingly close co-operation with Brazil, the OECD will have substantially strengthened its links with Latin America. Four other countries – Estonia, Israel, the Russian Federation and Slovenia – are currently negotiating to become members of the OECD, and it is also working closely with other major economies, including China, India, Indonesia and South Africa, as well as with Brazil. Since it began talks with the OECD in May 2007, Chile has taken significant steps by introducing new laws to end the banking secrecy that provides a shield for possible tax evasion and enabling prosecutors to pursue companies suspected of bribery and corruption. The Chilean economy has been growing at over 5% a year for the last 20 years. Impressive progress has been made in reducing poverty, although more still needs to be done. Chile’s groundbreaking pension reforms in the early 1980s have served as a model for many other countries. When the financial crisis hit in 2008, Chile’s prudent tax policies gave it the financial leeway needed for stimulus measures to support demand and employment. In recent months, as part of the OECD accession process, competition laws and consumer protection have been strengthened. New legislation has established a clear separation between the State and the board of copper mining company Codelco, Chile’s largest state-owned enterprise. In the private sector, a new law will boost transparency by requiring increased information for financial markets while combating misuse of insider information and reinforcing requirements for external auditors. A new National Policy on Chemical Safety is part of a drive to conform to OECD standards on environmental protection. Another major reform has seen the extension of public pension coverage. The OECD will release its latest Economic Survey of Chile on 28 January in Santiago. The Survey sets out the OECD’s assessment and recommendations on the main economic challenges faced by Chile.